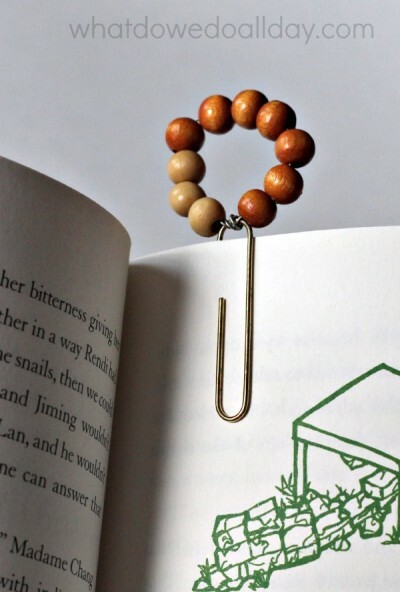 Handmade Mini Bookmarks: A Craft to Promote Reading! I don’t collect many things (who has the space?) but I do love my collection of bookmarks. 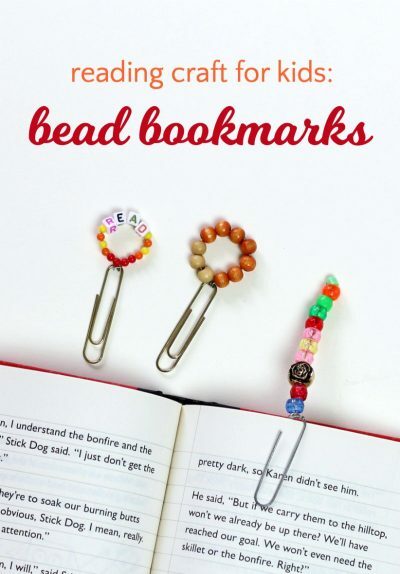 Bookmarks are also a simple craft that you can do with kids. It’s quick (always a plus with my active boys) and they can be put to use, unlike a lot of crafts which just sort of lay around, collecting dust. Today I am pleased to share a mini bookmarks craft collaboration with Babble Dabble Do. Ana is awesome designer so she supplied the project idea and we supplied a complementary book list. Be sure to check out the chapter books at the end of the post so you can get started using your new bookmarks! Ana made some very cute paper clip mini bookmarks out of Perler beads! 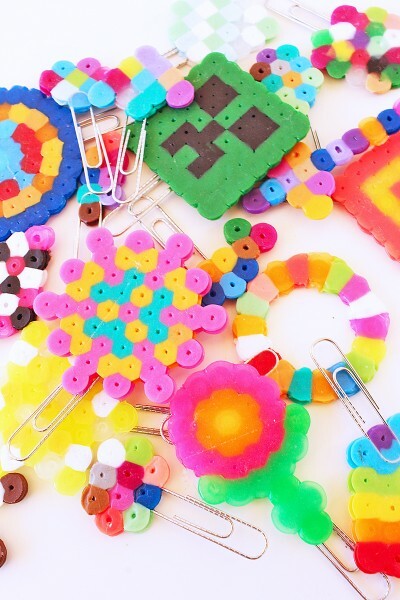 I decided to see what we already had on hand to work with, so my son and I headed to our bead bin filled with beads that had somehow made it into our lives. When you have kids you sort of magically accumulate stuff, right? Lo and behold there was a beaded necklace brought home from a school art fair that contained a few Perler beads. There weren’t enough to make more than one or two mini bookmarks so we also raided the pony and seed bead stash. I had some thin, flexible wire from a beaded snowflake making kit I bought before I even got married and never even used! Since I didn’t have a Perler bead grid, we used the wire to string a few beads before ironing them. We ran out of Perler beads pretty quickly, so I threaded some seed, wooden and letter beads on the wire, twisted it in a circle and then around the top of the paperclip. I’m not that good at making photo tutorials, but if I could figure it out, anybody can. In the top image, the far left Perler bead bookmark reminded my son of a lightsaber. To him, everything is a Star Wars reference! (Remember his clone trooper paper dolls?) 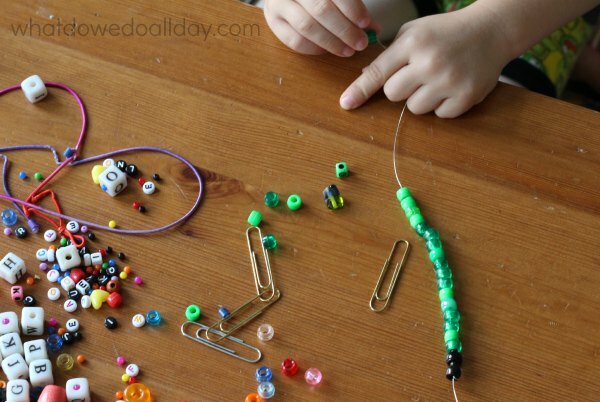 That bookmark inspired him to use green and black pony beads to make another lightsaber bookmark. He informs me that green lightsabers are the most powerful. Although I’m not sure about the fighting strength of a floppy green bookmark. But never mind. Don’t miss our never-lose-’em ribbon paper paper clip bookmarks! What better type of book to go with your kids’ fabulous new bookmarks than a chapter book with a reading and library theme? I’ve got five middle grade novels below that are great for readers ages 8 to 12. If your kids are younger, I have five more early chapter book recommendations at Babble Dabble Do that are great for ages 5 and up. Escape from Mr. Lemoncello’s Library. If you’ve ever dreamed of spending a night in the library, this is the adventure for you. Luigi Lemoncello, a world-famous game creator has designed the local library and 12 7th graders get to spend the night. They have exactly 24 hours to find the secret exit and win a prize. Originally on my list of 8 books for 8 year olds, The Case of the Case of Mistaken Identity follows 12 year old Steve, who dreams of being a detective and has studiously read and re-read The Baily Brothers Detective Handbook. He knows everything about solving crimes, which comes in handy when he finds himself thrown into the middle of an exciting mystery involving the United States Department of Library Sciences. Every book in this series has tons of adventure, twist and turns, loads of intelligent humor and a satisfying ending. I just started reading Inkheart and I love the metafictional aspect of it! There’s something so wonderful about characters escaping the confines of their stories. Meggie’s father’s read aloud skills are so magical is actually able to read characters out of the books! Unfortunately an evil character he has read out of a book is on a mission to bring him down and Meggie’s father has accidentally read his wife into a book. Spellbinding. My 9 year old has been speeding through the How to Train Your Dragon books and in book 6, A Hero’s Guide to Deadly Dragons, we find out that Vikings think books are dangerous. They even keep them locked up so they don’t influence young minds! Hiccup’s dragon is in trouble, and in order to save Toothless he must face the Hairy Scary Librarian and steal an important book. I hope your own library adventures are this fun, if not this dangerous. 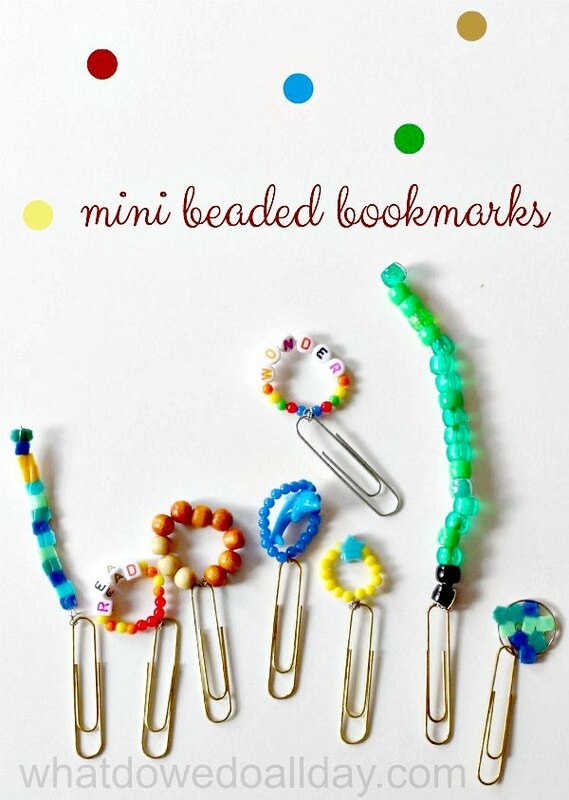 Don’t forget to head over to Babble Dabble Do and get the instructions for making these awesome Perler bookmarks. Is that a Minecraft bookmark I see in there? The one with wooden beads is like something you’d find on Etsy. I’m going to look out for The Great Good Thing. My daughter liked How to Train Your Dragon 7, not sure why she hasn’t circled back and read the rest of them. She also started Inkheart but I think she became overwhelmed by the length. There’s a sequel to TGGT, too. It’s a marvelous book. These really are cute! And now I have some new books to read – thanks, as always!